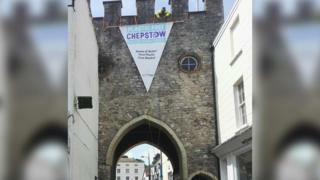 Image caption The plastic 'plastic-free Chepstow' banner unfurled on the town archway. A town has celebrated becoming "plastic-free" - by unveiling a giant plastic banner. Plastic-free Chepstow has said it does not oppose the use of all plastics. The giant banner was put up on Sunday in a ceremony attended by current mayor Tony Redhead after Chepstow's first 'plastic-free market'. "This is beyond irony," said Chepstow town councillor and former mayor Armand Watts. Do we use 8.5 billion straws a year in the UK? "The town council probably hadn't even thought about the material. If this is non-biodegradable, then it clearly should be removed and replaced." Chepstow was the first town in south Wales to be awarded plastic-free status. It joins Aberporth, New Quay and Aberystwyth, all in Ceredigion, as one of the UK's 301 plastic-free communities designated SAS. Communities must hit a number of targets to be considered plastic-free, including getting local businesses to avoid single-use plastics. Plastic-free Chepstow volunteer Tim Melville said that plastic had been chosen over cotton because it is hard-wearing. "Plastic has a valuable role to play - it is in phones and all sorts of products," Mr Melville said. "The sign will be used for many years to come. Cotton was considered but it would have degraded and torn because of the length of it." Mr Melville added that the description "plastic-free" was in reference to single-use plastics rather than all plastics. "We are never going to have a town that is completely plastic-free" he said. "What we are talking about is single-use plastic which makes up about 50% of plastics."